Even at a sturdy 70 tons, the North Atlantic right whale is no match for the huge ships that cross its path carrying cargo, passengers and the threat of lethal collisions. Now, a new app for the iPad or iPhone aims to help mariners off the US east coast avoid the rare whales so they do not strike them. The Whale Alert app takes information from underwater microphones to locate the whales in real time, which helps ships in New England waters avoid the species' estimated 550 remaining whales. The app also uses the GPS feature on iPads or iPhones to alert mariners if they are entering areas where right whales were spotted, or are known to frequent, along their migratory route from Florida to Maine. Those zones have mandatory or voluntary speed restrictions. 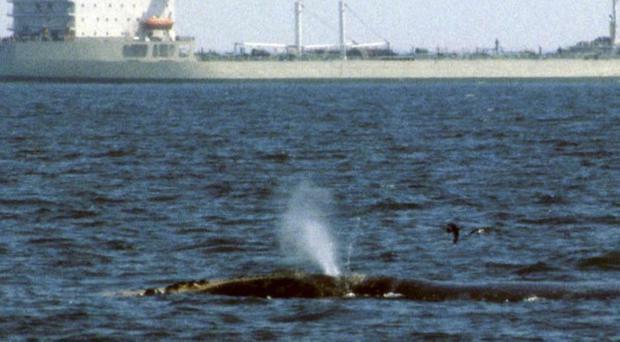 Preventing even one fatal ship strike can have a lasting effect on the right whale population. "Right whales are being run over by large ships and killed, but we can save them," said Patrick Ramage of the International Fund for Animal Welfare, which led the app's development. The North Atlantic right whale was hunted to near extinction in the late 18th century and has struggled since. The animal, which can grow to 55 feet in length, is vulnerable to ship strikes because it can be difficult to see as it feeds on plankton slicks near the surface. It is also oblivious to its surroundings while eating. Since the 1970s, an average of two North Atlantic right whales have been killed annually by ship strikes, though there has been one death in each of the past two years, said Greg Silber, a scientist with the National Oceanic and Atmospheric Administration. Whale Alert aims to make it easier for navigators to be aware of the various whale restrictions. Previously, ships often received that information via clunky technologies such as fax machines, VHF transmission, or not at all because their equipment was outdated. But vessels with the app are alerted when they enter areas with right whale restrictions (with a whale song sound effect). For now, the app can only locate the whales' real-time location off New England because it is the only region where special acoustic buoys are installed.